What are the challenges that Bahrain facies in light of the global economic crisis and low oil prices? We always stress that we are part of the region in which we live, as well as part of the whole world. Naturally, we are influenced by what happens not only in our immediate environment but in the larger one. No country in the world today is unaffected by that happens in any other region, despite distance or geographical separation. Undoubtedly, some of our sectors were affected by the global financial crisis, particularly the banks and other financial institutions and businesses that have deep business and financial relations with other countries of the world. Some of our financial institutions are branches of major foundations in the United States of America and Europe, and the mechanisms for continuous monitoring and follow-up of the conditions resulting from the global financial crisis have contributed to the furthest extent of our dealings and attitudes . The world is still facing significant challenges due to the global financial and economic crisis, a crisis made all the more significant coming, as it did, in the wake of the food and energy crises that preceded it and are continuing. We are sure that any effort will be limited in its success if it lacks collective action. Therefore, we are not adopting a "wait and see" attitude toward this crisis, but are working on the development of principles to prevent such a crisis from returning. These measures include the development of strategies based on coordination at the international level to insure the survival of free and open markets.Perhaps the role of each country in reducing the international repercussions of the global economic crisis lies in minimizing the effects on their own economies, while maintaing full and free access to the global market through procedures and policies of each country. Since the global financial crisis has cast its shadow over all of the nations of the world, the Government of Bahrain has moved resolutely to initiate measures to confront the repercussions of the crisis. The Central Bank of Bahrain has been meeting continuously with banks, businesses, and financial institutions in order to agree on mechanisms to face these consequences. What type of competition does Bahrain face from Doha and Dubai? Does this affect the economy of Bahrain? And how? We do not look upon the progress achieved by any sister country as competition, but regard it a type of integration with others. This means that the diversification of resource development and income opportunities in any one country is a benefit to all—at least as long as no one country has a monopoly. Therefore, we always call for cooperation and coordination. Today's global economy is based on partnership, cooperation, and large economic entities. We, in the GCC countries, have great prospects for cooperation in many areas, which will benefit all. We always stress the specialization and level of experience of Bahrain as a financial and commercial centre. We are pleased and proud that success has been achieved in this respect, thanks to the efforts made and the services provided in order to meet the evolving needs of banks and the financial institutions, as well as the advanced control legislation which gives confidence and safety for capital invested in this vitally important sector. The legislation we have adopted is best in the fields of banking, and financial activities and services, according to specialized international standards. In Bahrain, we have many privileges that encourage investment. Our legislation and commercial practices allow foreign companies to own property in full, and we have no personal or partnership taxes. 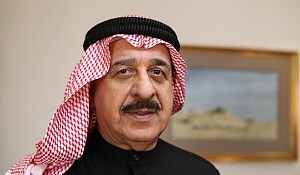 In addition, there are no restrictions or control on money exchange, or on re-export of capital, profits, and shareholders.Bahrain's active policy in this area, and its search for an economy of high value-added economic growth, has made Bahrain's policy to encourage investment flows, which make a greater contribution to strengthen this trend as an active and influential force in economic growth.The monetary value of our currency, as you know, is stable and convertible. It is linked to the U.S. dollar, which has long been at a fixed price. We are proud of the existence of our infrastructure and services of high- level communications with low costs. Prior to this we have developed the most important possession of any country in the world, which cpnsists of the evolving human resources of our nation, including the skilled manpower and specialized education necessary to meet the needs of the multi-various investment projects in the Kingdom of Bahrain." Therefore, we always stress that our policies have gone far beyond the traditional outlook that sees assets only in terms of physical structrures or buildings. We consider that the most valuable assets to be developed are human resources, education, and the search for new knowledge. In 2010, when a unified currency for GCC countries comes to effect, how will it positively affect the countries of the region? We have always called for Gulf integration. We believe that this is the best way to develop the economies of the member states of the GCC. Especially today we live in an era of giant blocs and big entities. Without any doubt, the achievements of the GCC countries over the past years are remarkable. Our policies are calculated by the leaders of the Council, and they have contributed to the stability and well-being of the peoples of the region. But our aspirations do not stop at this point. The aspirations of the peoples of the GCC look forward to more. We trust in the wisdom of the GCC leaders to achieve much more integration in the near future, and this will be good for all the countries of the region. We in the Kingdom of Bahrain are aware of the importance of the issuance of a unified currency by the GCC countries and we trust that our brothers in all member states of the Council share our optimistic view of its beneficial nature for all the countries in the region. With regard to the name of the single currency, it is not easy to agree on its name, due to various differences among the economies of the member states. This will take some time, and we hope that the dealings among all the member states will continue in the proper channels, so that we shall all achieve the same levels of freedom of movement of people and goods among the member nations of the GCC as already exists in the European Union.What are the challenges that you see facing Bahrain within the next five to ten years?Our work will continue and does not stop. We aspire to greater achievements in all areas, especially to improve the environment of business in order to increase production, and to raise the standard of living of our citizens. The coming years shall witness, God willing, greater development in providing better education, health care, and housing services more quickly to citizens. We hope to increase the job opportunities for thousands more of our educated citizens to fill jobs in the labor market annually. Development steps will also continue, and political practice will be enhanced by the growing cooperation between the executive and legislative organs in the Kingdom. We expect to see more maturity in our parliamentary practice and greater legislative achievement in the best interest of our homeland and its citizens. We are optimistic about the future of Bahrain. We have absolute faith in the ability of our people to achieve even more in the future. Our efforts will continue as they have in the past to make Bahrain an oasis of safety and stability.